Fremont Township was the eighteenth town organized in the county, and was created by the county board of supervisors on the 11th day of March, 1874. In the order describing the boundaries of the town the county board neglected giving the new town any name. It became known as Fremont, presumably named after General John Charles Fremont, who was extremely popular at the time because of his exploration of the Great West. The town consists of township No. 25, R 1 E. The first town meeting was held at the Heathville school house. John Charles Frémont, sometimes called "the pathmarker", was an American explorer, soldier, and political leader. He was born in Savannah, Georgia and became a skilled mathematician who taught the U.S. naval cadets before becoming an assistant on a surveying expedition (1838–39) between the upper Mississippi River and the Missouri. He eloped with Jessie Benton, the daughter of Senator Thomas H. Benton in 1841. Once her father became reconciled to the marriage, he helped his son-in-law secure the command of an expedition to explore the Des Moines River. The next year (1842) Frémont headed an expedition to the Rocky Mountains with Kit Carson serving as guide. His informative reports stirred wide interest in the American West. In 1845 he returned to California and participated in a revolt against the Mexican authorities and set up (1846) the Bear Flag republic at Sonoma. Stephen W. Kearny and Commodore Robert Stockton quarreled, as both had explicit orders which placed them in command. Frémont sided with Stockton, accepting an appointment as civil governor. After Kearny received orders which indicated that Stockton was not his superior, Frémont was arrested, court-martialed, and found guilty. President Polk remitted that penalty, but Frémont, ever proud, resigned from government service. In 1848 he led an effort to locate passes for a transcontinental railroad. His fortunes climbed once gold was discovered on his California estate, but he was deprived of some of his wealth by the trickery of others. He served as one of the first U.S. Senators from California (1850–51), and in 1856, the Republicans chose him as presidential candidate. 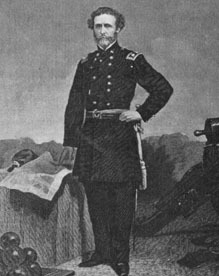 During the Civil War he was given command of the Western Department, but was removed because of his radical policy toward slaveholders. He was given a new command, but resigned. Around 1970, his unsuccessful attempts to construct a railroad to the Pacific—accompanied by actions of his agents that roused suspicion—cost him his fortune. Financially devastated, he struggled on, supported by his wife's earnings from writing and by an appointment as governor of the Arizona Territory (1878–1883). In 1890 he was given a belated pension for his Civil War Service, but did not live long to enjoy it. He is one of the most controversial figures of Western history. His critics called him a braggart and thief; his supporters admired his courage, his handling of men, and his sheer determination to explore the West. John Charles Fremont's fame as the "pathmarker" was the result of his informative documentation of the West. The first Yankee explorers of the western territories, had only brought back sketchy maps. Fremont retraced the routes of the former explorers and with his skillful map making, his supremely accurate surveys helped later pioneer American's find their way West.